In 1860, Charles Francis Hall (1821-71), the American explorer, embarked on the first of two voyages to the Canadian Arctic region aimed at investigating the fate of Sir John Franklin’s lost expedition of 1847. During his time in the Arctic, Hall lived amongst the Inuit community, learning their language and embracing their everyday life. First published in 1864, Hall’s two-volume work remains of great interest to anthropologists, sociologists and geographers. His eye-witness accounts of the indigenous people’s dwellings, hunting pursuits, birth and death rites, transportation, interpersonal relationships, and survival strategies in severe weather conditions provide an insight into Inuit culture in the nineteenth century. In Volume 2 he tells of his discovery in Frobisher Bay of artefacts from Martin Frobisher’s sixteenth-century mining venture; the survival of these relics, together with his understanding of Inuit memory systems, convinces him that traces of Franklin and his crew may yet be found. Charles Francis Hall (1821 – November 8, 1871) was an American Arctic explorer. Little is known of Hall’s early life. He was born in the state of Vermont, but while he was still a child his family moved to Rochester, New Hampshire, where, as a boy, he was apprenticed to a blacksmith. In the 1840s he married and drifted westward, arriving in Cincinnati, Ohio, in 1849. There he went into business making seals and engraving plates, and later began to publish two small newspapers, The Cincinnati Occasional and The Daily Press. 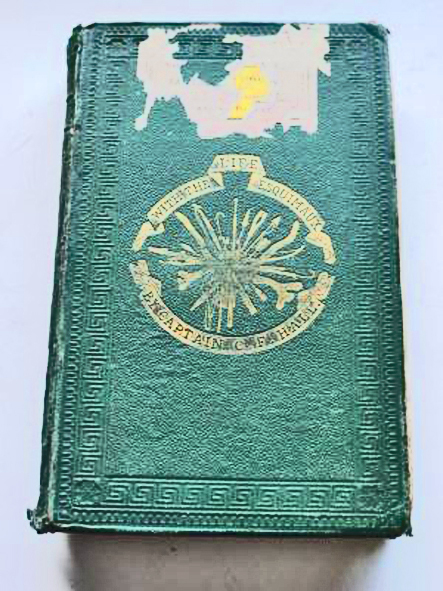 Around 1857, Hall became interested in the Arctic and spent the next few years studying the reports of previous explorers and trying to raise money for an expedition, primarily intended to learn the fate of Sir John Franklin’s lost expedition. In 1860, Hall began his first expedition (1860–63), gaining passage out of New Bedford on the whaler George Henry under Captain Sidney O. Budington, whose uncle James Budington had salvaged Edward Belcher’s exploration ship HMS Resolute, also on the “George Henry”. He got as far as Baffin Island, where the George Henry was forced to winter over. The Inuit told Hall of surviving relics from Martin Frobisher’s mining venture at Frobisher Bay on Baffin Island. 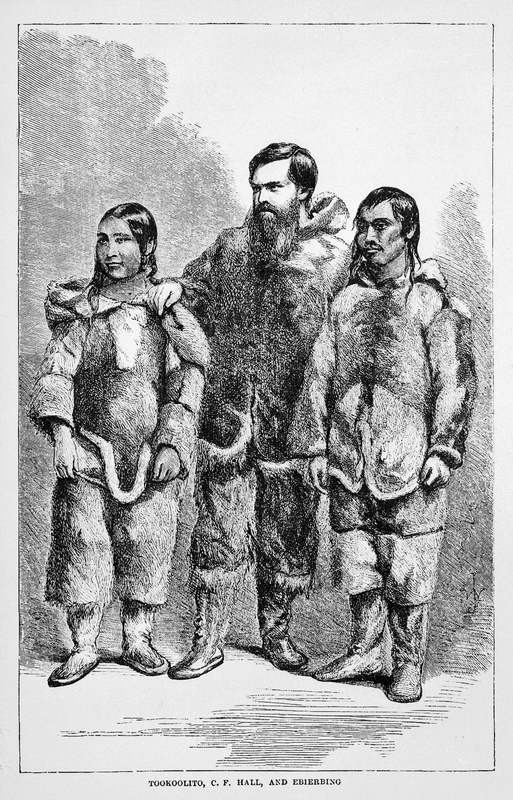 Hall soon travelled there to see them first-hand, drawing upon the inestimable assistance of his newly found Inuit guides Ebierbing (“Joe”) and Tookoolito (“Hannah”). Hall also learned what he interpreted as evidence that some members of Franklin’s lost expedition might still be alive. During 1863 Hall planned a second expedition to seek more clues on the fate of Franklin, including efforts to find any of the rumoured survivors or their written records. The first attempt using the 95-ton schooner Active was abandoned, probably due to lack of finances caused by the American Civil War and a troubled relationship with his intended second-in-command Parker Snow. Finally, in July 1864, a much smaller expedition departed in the whaler Monticello. During this second expedition (1864–69) to King William Island, he found remains and artifacts from the Franklin expedition, and made more inquiries about their fate from natives living there. Hall eventually realized that the stories of survivors were unreliable, either by the Inuit or his own readiness to give them overly optimistic interpretations. He also became disillusioned with the Inuit by the discovery that the remnants of Franklin’s expedition had deliberately been left to starve. He failed to consider that it would have been impossible for the local population to support such a large group of supernumeraries. Hall’s third expedition was of an entirely different character. He received a grant of $50,000 from the U.S. Congress to command an expedition to the North Pole in the ship Polaris. The party of 25 also included Hall’s old friend Budington as sailing master, George Tyson as navigator, and Dr. Emil Bessels, a German physician and naturalist, as chief of the scientific staff. The expedition was troubled from the start as the party split into rival factions. Hall’s authority over the expedition was resented by a large portion of the party, and discipline broke down. Polaris sailed into Thank God Harbor (now called Hall Basin) on September 10, 1871, and achored for the winter on the shore of northern Greenland. That fall, upon returning to the ship from a sledging expedition with an Inuit guide, Hall suddenly fell ill after drinking a cup of coffee. He collapsed in what was described as a fit. For the next week he suffered from vomiting and delirium, then seemed to improve for a few days. At that time, he accused several of the ship’s company, including Dr. Bessels, of having poisoned him. Shortly after, Hall began suffering the same symptoms, and finally died on November 8. Hall was taken ashore and given a formal burial. The official investigation that followed ruled that Hall had died from apoplexy. However, in 1968, Hall’s biographer Chauncey C. Loomis, a professor at Dartmouth College, made an expedition to Greenland to exhume Hall’s body. 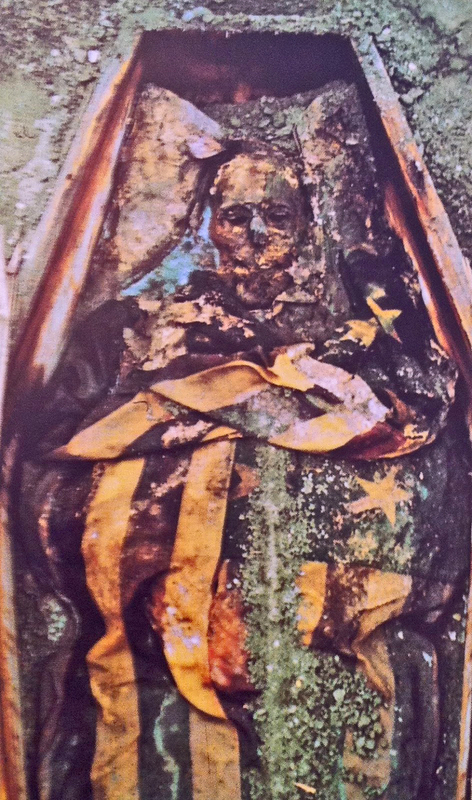 To the benefit of the professor, permafrost had preserved the body, flag shroud, clothing and coffin. Tests on tissue samples of bone, fingernails and hair showed that Hall died of poisoning from large doses of arsenic in the last two weeks of his life. This diagnosis is consistent with the symptoms party members reported. It is possible that Hall treated himself with the poison, as arsenic was a common ingredient of quack medicines of the time. It is also considered possible that he was murdered by one of the other members of the expedition, possibly Dr. Bessels. No charges were ever filed. Kevin Acott(pub.2017) read more about it here.